Opening times: 12th February to 31st October. 10:00 am to 5:00 pm daily. How to get there: By Road: Leave the M5 at junction 11 and follow the A40 towards Ross-on-Wye. Turn left onto the A4136 towards Monmouth and then left again onto the B4228 towards Coleford. Pass through Coleford and turn right at the Lambsquay Hotel. Clearwell Caves are signposted from Coleford. By Rail and Bus: The nearest station is at Lydney Then 722 bus -alight at Milkwall -0.5 mile walk. The Stage Coach bus No. 31 from Gloucester also stops at Milkwall. Additional information: The caves are a natural system in Carboniferous Limestone, known locally as 'Crease' limestone. The caves became partially filled with iron ore. The underground tour is unaccompanied and takes the visitor through nine well-lit caverns. There are displays of minerals, mining tools and machinery. Traces of older mining techniques such as fire-setting and use of picks may be seen on the walls. Stout footwear is recommended, however the mine is unsuitable for the less able. Parking is free and there is a large picnic area. The tea room sells snacks and refreshments. A variety of gifts and information on local mining are also on sale. Guided tours can also be arranged for the more adventurous groups (over 15 people). They involve some climbing, some crawling and getting dirty! Experienced guides ensure that the trips are educational and interesting. Helmets and lamps are supplied. Telephone for details. 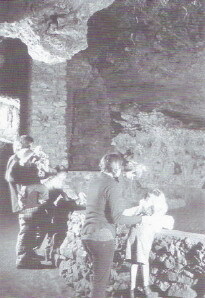 Clearwell Caves now produce a range of paints (yellow, red and purple ochre) made from the native iron ores suitable for artwork. decor and pottery glazes. Telephone for details and leaflet, or email ochre [at] clearwellcaves.com.